Carol Buckley, founder of Elephant Aid International, says that “As long as tourists will pay money to ride elephants, savvy businessmen will exploit elephants for the fortune to be made” and she also reports that two elephants died last month in Nepal after long days of labor. 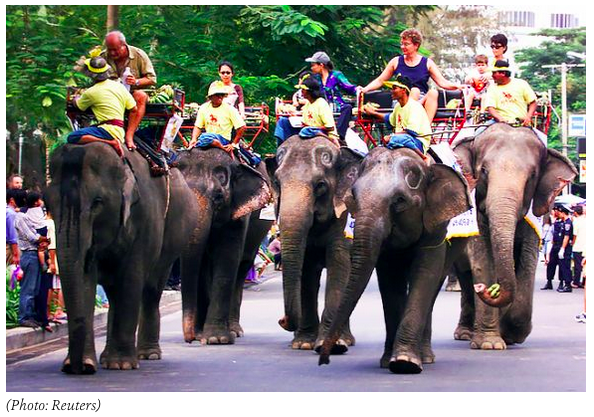 Considering there are just over a hundred or so captive elephants currently working in Nepal’s Safari Ride industry, this is of grave concern. Carol also reports from Chitwan that as many as a third of the elephants are infected with tuberculosis, which they contract from humans and then pass to one another. So please support EWN and Carol in our efforts to help these sick and overworked elephants. For more info on the current situation, see this recent article on takepart. This entry was posted in Elephant Rides and tagged animal welfare, booking agent, elephant rides, elephants, Safari rides, tour company, tourist, world animal protection. Bookmark the permalink.